There is nothing quite so empowering as being able to slay in a statement piece. Huges works of acrylic, enamel, metalwork, and gems can take an otherwise unassuming ensemble and crank the volume to eleven. We all have our favorites. Those go-to, chunky pieces we can rely on to keep us looking fierce even on our most-dressed down days. Many of us have a broad selection of statement pieces. We add to that collection the classic pearls necklace and long, low hanging medallions. Bulky pendants and glittering jewels round out our collection. And then, in the back of the collection, too oft forgotten live the tiny, dainty pendants on short chains. They are back there, just collecting dust. There are the standards that see the light of day from time to time. 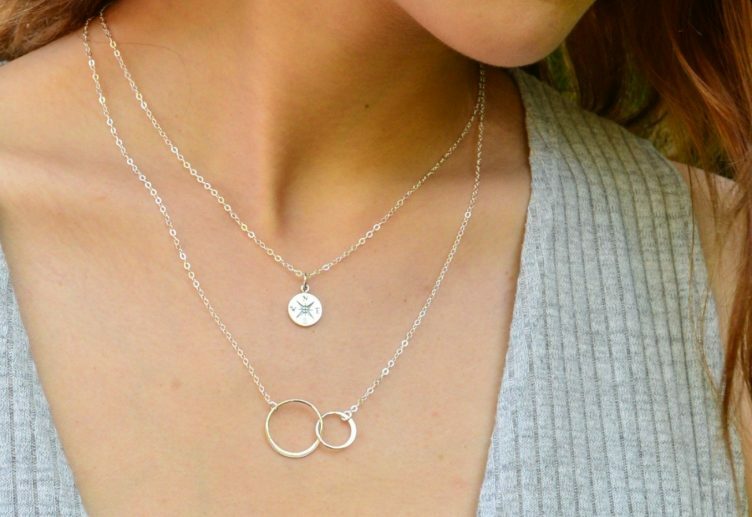 Simple chains and a solitaire pendant are easy parts and pieces for a layered look. Occasionally we might dust off the old astrological sign if we are feeling a bit spiritual. But for the the most part what few understated pieces we have do not get a lot of love. We are here to remedy that. Perhaps they get a little lost in the shuffle or perhaps you have just fallen out of love with the designs. The easiest answer is to refresh the collection. Dainty necklaces are a staple in this new trend of layered looks. So best to top off the supply with a few new, on-trend pieces. Typically dainty necklaces are viewed as every-day pieces. This is mostly because the tiny charms and thin chains are often so simple they can go with anything. T-shirts and v-necks are always made better by a tiny charm. Even your work-out clothes can stand to be gussied up with a cute miniature necklace on your way to the gym or hot yoga. Statement pieces and jeweled wonders reign supreme on the red carpet. And why shouldn’t they? The red carpet is the premier setting for all the glitz and glamour of the world. They lead into performances and premieres that whisk us away to other worlds and new lands. They are a break from reality. It stands to reason that the celebrities that walk those red carpets look out of this world too. But there has been some clever uses of dainty necklaces on the red carpet as well. It all depends on how you style it. Sometimes more is better everywhere. Red carpet rules are often not the same rules we abide by when styling our own looks, even the over the top ones. 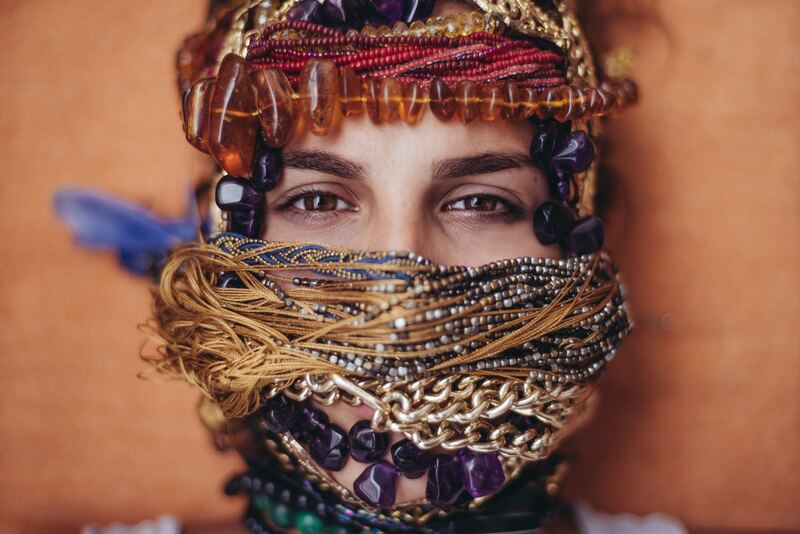 Huge earrings can be paired with massive necklaces and doozies of bracelets and no one will bat an eyelash. Well, most of the time anyway. In daily life, the typical rule of thumb is one WOWZER piece and the rest should be paired to complement and not detract. Sport some hefty earrings and a necklace might be skipped altogether, even a dainty one. This keeps your big, bold pieces in the spotlight. There have however been a handful of stars that have brought subtlety to their looks with dainty necklace and gotten away with it. More than that, they positively killed it. The inimitable Emma Watson is, naturally, first on our list. Her very fifties pin-up inspired look on the red carpet in Madrid featured a messy, pulled-up hairdo, a multi-colored betty dress we feel the need to own immediately, and a simple, dainty little gold necklace with three small white gems. Overall, this red carpet looks almost feels as if it could scoot right on over to brunch with the gals or a board meeting in the upstairs conference room. Of course, Emma Watson could show up in a sweat-stained jersey tracksuit to the red carpet and we would fawn of that too. So there’s that. Zendaya showed up to the Spiderman: Homecoming premiere in a shockingly blue, frilly number and a dainty silver bar necklace. She let the dress do all the talking with just the tiniest little exclamation point added by her downplayed jewelry. For earrings, she elected a sizeable silver hoop that also managed to be pretty subtle with her beach wave hairstyle. She added a stunning blue and silver-toned shoes that tied both together beautifully. Singer Janelle Monae put together a stunning look featuring a simple black velvet choker with a dainty little pearl charm at the 2018 Essence Black Women of Hollywood show. The necklace complemented her black and pearl above the knee dress. Of course, she knocked it out of the park with a gargantuan statement earring. A single chandelier most people would not have been able to pull off as a necklace hung from her left ear. But that’s the beauty of simple necklaces. It leaves a lot of room for powerful looks elsewhere on the ensemble. 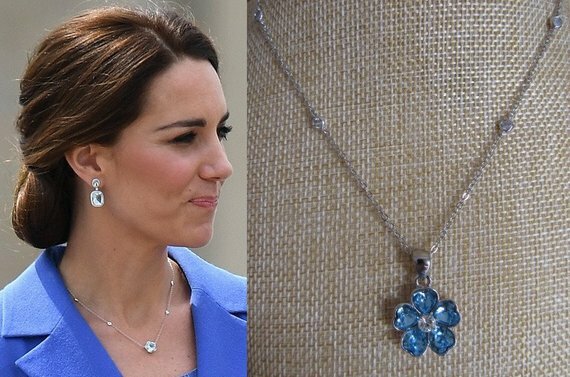 Kate Middleton may not find herself on the red carpet to often but she is the queen of dainty jewelry. The soon-to-be queen has absolutely mastered the use of subtle pieces. It may have a lot to do with the very strict style guides the British Royals are subject to, but she has absolutely made it work. A dainty, bejeweled flower and little offset bead is an absolutely amazing glimpse of glitz over her otherwise all business blue suit. Really, any quick search engine query for our favorite royal will yield result after result of her playing the downplayed game and winning every time. The beauty of dainty necklaces is that it leaves a little room for some very playful charms. Wear a piece too big and you might end up looking a little juvenile. But electing a tiny charm means you can pull off wearing your favorite fandom pieces with looking like you are waiting to enter Comic-Con. Have a love of vintage video games, you can absolutely pull off your favorite Nintendo character as a part of your every-day jewelry ensemble in the form of a tiny little bauble from an understated chain. Everything from airplanes to Hello Kitty becomes far more acceptable when presented in miniature. Of course, dainty necklaces are also a fantastic way to gather a collection of fine jewelry without going head over heels in debt for it. A diamond is a diamond and simple, muted solitaires on a thin chain can be just as powerful a piece as a waterfall of them around your neck. Our Editor-in-Chief has personally gathered a top ten list of dainty necklaces to refresh your collection. She obviously has a few favorite brands for subtle pieces, but when you find a maker you love, best to keep them at the top of your list. Perhaps adding a few more pieces will bring those small pieces to the forefront of your collection. First up is this piece by Pavoi. 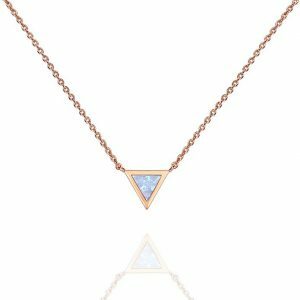 14k of rose gold surround a triangle of beautifully iridescent opal. Hung from a sixteen-inch chain with an optional eighteen-inch extender this necklace is the absolute epitome of everything a dainty necklace should be. It makes a bold statement in the most subtle way. Triangles are shapes of strength. Each of the three sides must accept help from the other two to remain firm. Triangles have had such an impact as a shape that the first known written language, known as cuneiform in Ancient Sumeria was a collection of lines, angles, and triangles. The Great Pyramids of Egypt, one of the wonders of the ancient world that made it through antiquity are four triangles. The triangle is found as a symbol in the Christian faith as a representation of the Holy Trinity. In Celtic beliefs, it is the eternal relationship of life, death, and rebirth. Present in the art of the Egyptians, Nordic cultures, Germanic kingdoms, and African tribes, a simple shape has infused so much meaning and symbolism across the globe. With that much history, this stunner needs to be added to your dainty collection now! It is no secret we love combining gold tones. This piece does it for us. 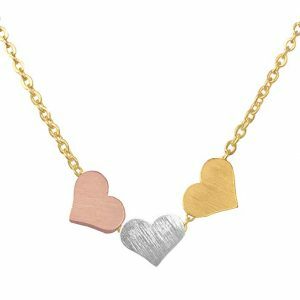 Choose your chain color from yellow gold-tone, silver-tone, or rose gold-tone and you will still get three tiny little heart charms, one in each color. We love that Altitude Boutiques chose a very brushed metal finish rather than the standard high polish we are most accustomed to. It adds a certain vintage feel without looking forced. The matte finish is becoming very popular among jewelry designers and to be honest we are kind of excited. Any sort of shift in trend means we get to buy a whole bunch of new pieces. 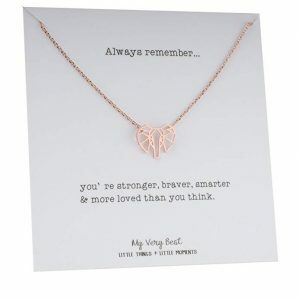 This necklace is an absolutely perfect gift for sisters or three generations of women in one family. Purchase one in each chain color and present one to each member of the family. One color heart for each recipient. 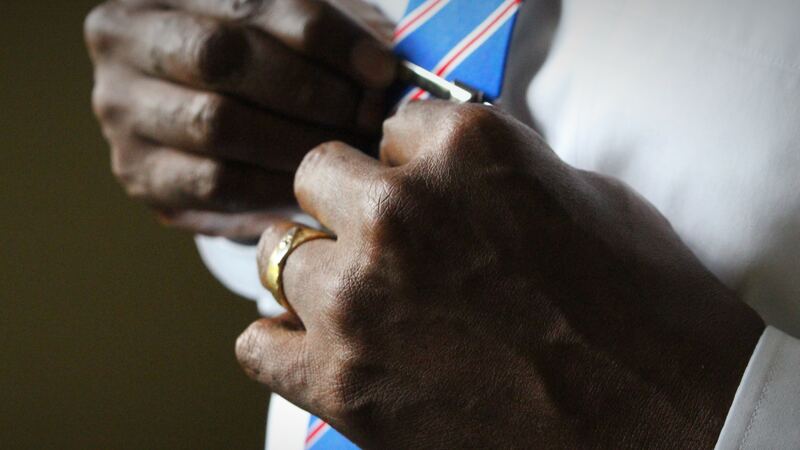 The oldest can be represented by the yellow gold and should have the yellow gold chain. The middle gets the silver heart and the silver chain. And the youngest and newest addition to the family gets the rose gold heart on the rose gold chain. This is such a touching way to celebrate women that mean so much in your life and to each other. Wonderfully designed it is so much more special when such meaning is given in the giving and receiving of it. Next on our list is a piece for the adventurers, travelers, and world explorers. This sixteen-inch chain hangs a simple circle pendant with a compass rose cut-out. North, South, East, and West are marked with simple stamped letters at their proper locations. 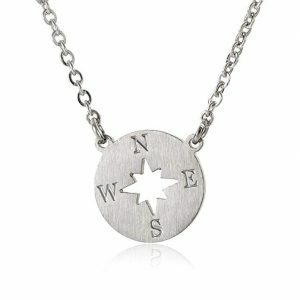 An economical selection in stainless steel, this piece is tailor-made for folks with a wanderer’s spirit. Since stainless steel is hearty, hard to damage, and incredibly hypoallergenic it can travel with the traveler with ease. 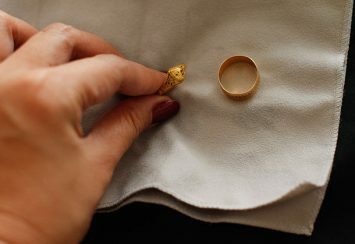 We love fine metals and gold-plating but sometimes a good, solid piece that is not going to be a hassle is important. Especially for a daily-wear piece, we love stainless steel. The history of the compass rose is a little unclear. We know travelers’ of ancient times used a myriad of techniques to navigate but compasses may or may not have been in their arsenals. We do know that the compass first appeared in the written record in 1200AD. Clearly, exploration was happening before then, perhaps with a compass but no one bothered to write it down if it did. Flavio Gioia of Italy was credited with the invention of the first compass. He combined a wind rose and a lodestone to find the magnetic North and South of the globe. Since these things are fairly static, within a few miles, you could always rely on your properly tuned compass to point you in the right direction. Nearly a millennium later and the compass is still an effective means of finding your way. It is also a powerful symbol for those who feel the need to explore. This dainty compass is perfect for those same folks. The olive branch has long been a symbol of peace. Our editor’s next pick is as peaceful as they come. A sixteen-inch chain with an optional two-inch extender hangs an single olive branch in a static position. Offset to the left is a single crystal, wrapped in gold. 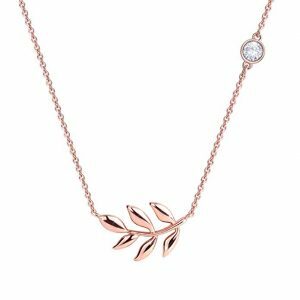 Made of polished plated alloy in your choice of yellow gold, rose gold or sterling silver, the piece is very straightforward. There is no detail carved into each leaf nor the branch. Just a simple, stunning representation of a symbol of peace. The olive branch became a symbol of peace in the very earliest days of the Judeo-Christian story. When Noah, the builder of the famous ark that saved animals two by two from a global flood, released a dove from his boat, it returned with an olive branch. This was significant because it meant that the flood waters had receded enough for an olive tree to grow and bloom. Noah and his menagerie had survived global catastrophe. It became a promise of peace between the Judeo-Christian God and mankind. Their god promised that he would never again destroy the world and the olive branch was made into a symbol of the promise. Today, the idea of an olive branch as a peace symbol carries forward in national flags. The flag of the United Nations features two olive branches surrounding a globe. The nations of Cyprus and Eritrea also have olive branches. This piece of jewelry is perfect for the peaceful person, a person who needs peace or someone who just really likes the look, like our editor. Remember when we said that dainty necklaces gave us the chance to show off our quirky sides without being too out there. Allow us to do so with this next selection. 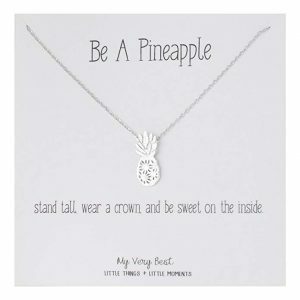 Offered by maker My Very Best, this silver wonder is a charming little pineapple charm. We absolutely love it! The card it arrives on is emblazoned with the bold words of encouragement “Be a Pineapple. Stand tall, wear a crown, and be sweet on the inside.” How absolutely adorable is that. For the record, that is absolutely our new mantra! 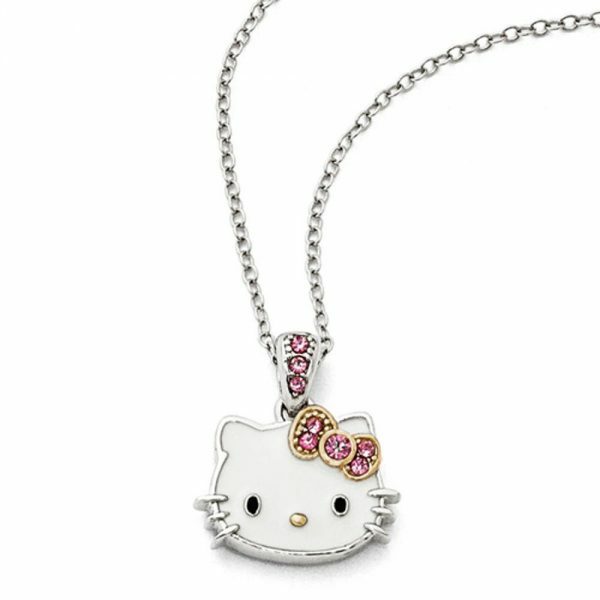 The delicate charm is silver plated and arrives in a fifteen-inch chain with an optional two-inch extender. Tiny little cuts outs and relief carvings add texture to the otherwise unassuming charm. This is an adorable piece that will go well with everything. Literally, everything. Pineapples are traditional symbols f welcome and good fortune. They are often presented to new neighbors and homebuyers as a sign of greeting. This welcoming little piece is welcome with any outfit. Our editor loved the My Very Best pineapple so much she kept digging through the offerings by the same maker. 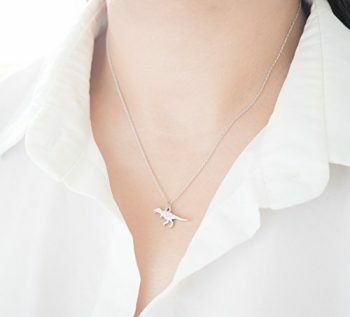 She came upon this clever little Tyrannosaurus Rex charm and loved it almost as much as the pineapple. (Almost. Seriously we cannot get over how adorable the pineapple is.) While this piece is a little less detailed, it is no less cute. Once more in silver, this prehistoric creature with its tiny arms and powerful tail features a hammered look. It comes on a fifteen-inch chain with an optional two-inch extender as well. At that length, it is positively a choker. It is also appropriate for gifting to the younger generations of jewelry lovers. The tyrannosaurus rex is likely the most famous and one of the most fearsome dinosaurs. We all grew up knowing about the t-rex. Recently paleontologists have come to rethink the t-rex in terms of its makeup, believing it may have rocked feathers along with all those massive teeth. It is the iconic dinosaur, really. It is also a symbol of strength and ferocity. This necklace is certainly fierce for its tiny size. The card comes with the quote “The t-rex has arms so short it holds everything close to its heart.” Such a touching little sentiment we never would have thought of. Now we will never forget it. We love it for a playful little touch to any ensemble. It is small enough to blend and add the quirky pop everyone needs from time to time. A third and final find from the apparent masters of dainty necklaces, My Very Best, this elephant charm is stylish in so many ways. First, it is presented in ultra-trendy rose gold. The warm, reddish gold is getting to be everywhere and we are not even mad about it. The charm and fifteen-inch plus two-inch extender are both in the rich, warm rose gold-tone. Second is, of course, an elephant. Elephants have been a popular theme in jewelry for years. Popular in Asian designs and a symbol of luck and good fortune, the particular charm breaks the mold a bit. This elephant is an African elephant, the close cousin of the more often represented Asian elephant. The ears are in the shape of the continent of Africa. The African elephant is larger than its Asian counterpart but no less amazing a creature. Third, the elephant is detailed out in a geometric design. Popular in jewelry, home design, and, most especially tattoo artwork, the simple lines forming varying shapes are very on-trend right now. This elephant makes very clever use of that trend to create a dainty necklace that will be a boon to any ensemble. 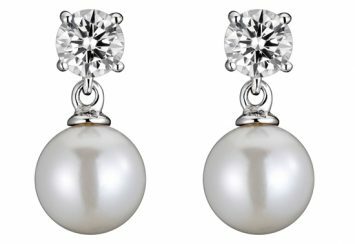 Finally straying away from our apparently beloved designer, My Very Best our editor actually returned to jewelry creator Pavoi. 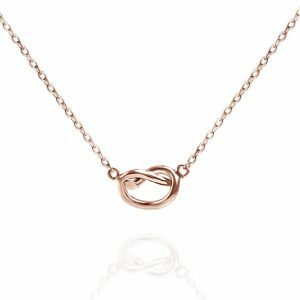 This rose gold knot is simply designed but powerfully worn. The sixteen-inch chain (with the two-inch extender) holds a simple knot, two ends of the same length of rose gold, crossed gently at the top. Traditionally a symbol of eternity and love, the shape closely resembles the infinity sign. 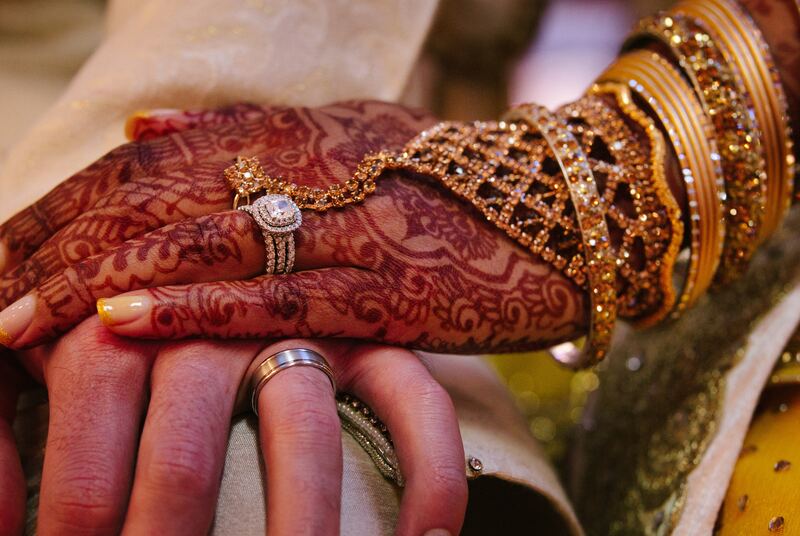 When a couple marries they are said to “tie the knot.” Knotwork is both a craft and an art form for various cultures. Celtic designs are referred to as knotwork. Sailors and boy scouts alike spend days, months, and years perfecting their knot-making. This dainty necklace is the perfect gift for a wedding present or anniversary. With the obvious shout-out to marriage and eternal love, you really cannot go wrong with such a simple but meaningful piece of jewelry. 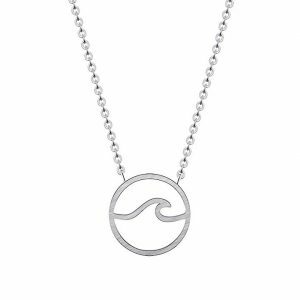 This uncomplicated charm is perfect for anyone with a love for the beach. An open circle with an undemanding line in the shape of a wave slicing through the middle of the open space is presented in silver-tone. A wave is a symbol of power, determination, and an unrelenting spirit. In nature, waves can be a gentle lap on the beach or an unstoppable force of destruction. This is true of people who closely associate with the form of the wave. They can be gentle and comforting but the can also be a force to be reckoned with. We love the use of negative, or open, space in this piece. Often times too much open space in a pendant and the detail is lost. The creator of this charm avoided that pitfall, however. 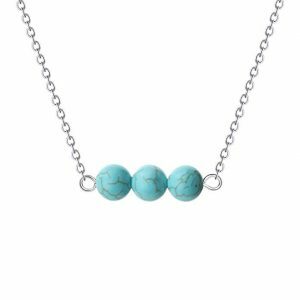 Wear it with blues, greens, teals, and turquoise to really play up the watery nature of this charm. Finally, we come to a simple bar necklace, surprisingly the first and only on our list of dainty necklaces. While we have presented the sample featuring turquoise spheres, the creator offers a whole slew of pearl beads on several different gold tone combinations. We are fond of turquoise, naturally. But you can select the stone of your choice. You can also select a chain length of anywhere from fourteen inches for a true choker to eighteen inches for a longer look suitable for a more versatile layering use. The piece is very effortless featuring just a length of chain, a simple wire bar capped with loops to hold the chain and three beads. That is it. For our list full of meaning and sentiment in the charms, this is just a pure expression of style. Use it as a pop of color in a monotone outfit or pair it with other pieces to add texture. With layered looks currently all the rage, dainty necklaces are coming back into fashion and fast. These are always wonderful pieces to wear at the fifteen, sixteen, or seventeen-inch range as the capstone of any layered look. We love combining gold tones as well, so never you mind if your favorite dainty necklace comes in yellow gold when your big bulky piece features rose. Add a third in a white gold tone and you are set. 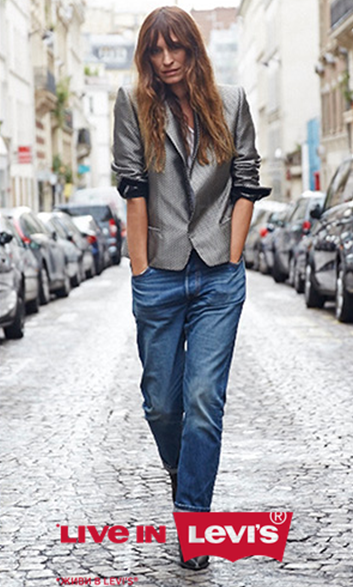 Not all layered looks need to be tiered either. 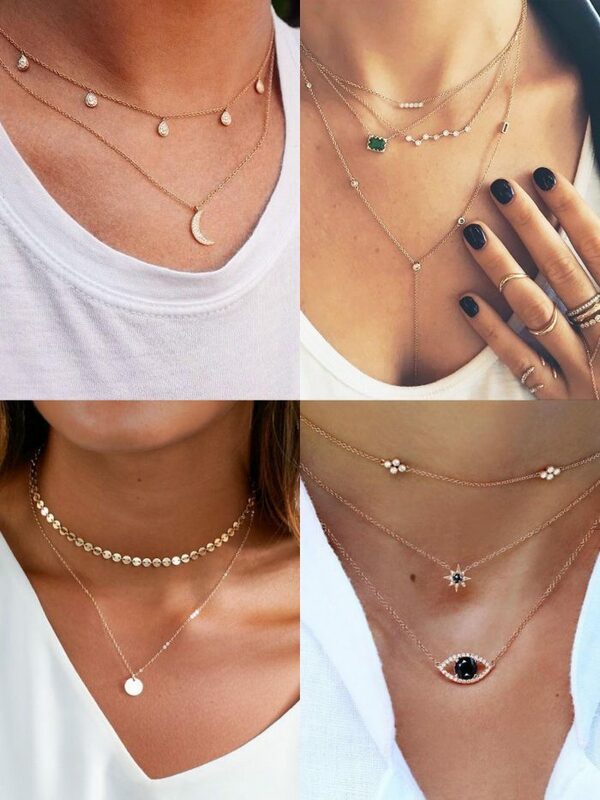 There is something so very playful about a series of similar length necklaces all gathered about your collarbone. Play with subtle themes as you arrange yours. Combine a series of lucky charms, or recreate the whole box of cereal on several different chains. It is a very hippy look that we are really coming to appreciate. 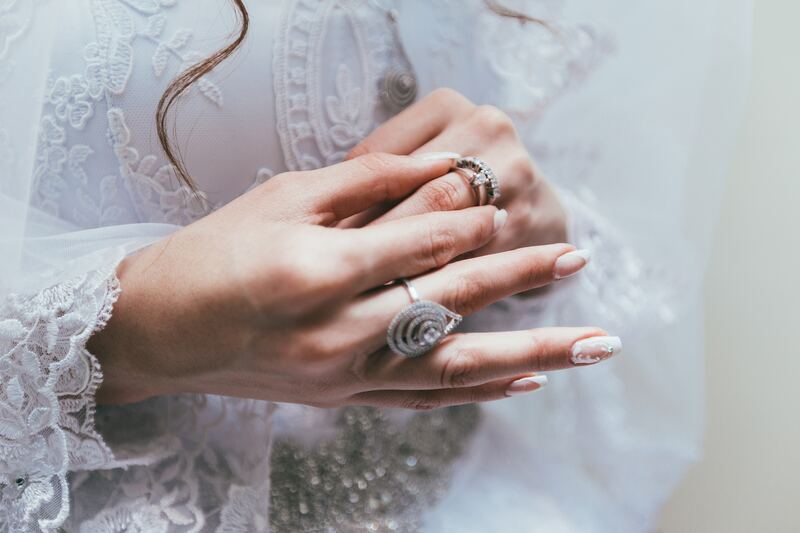 As with all jewelry, a daily wipe down to remove oils and dirt is a must. A good rub-down with a microfiber cloth is never amiss. However, storing these tiny little things can be a pain from time to time. Too often the daintier the necklace, the thinner the chain. And if thin chains are good for anything beyond subtle looks, it is tangling into unfixable knots. The thin little chains have a knack for getting themselves so hopelessly wrapped up, we are loathed to remember how many perfectly good pieces were total losses to rat’s nests. As often as possible, your smaller necklace, no matter their worth, should be stored in jewelry boxes. Some may arrive in pouches upon order. We recommend you save those pouches for heavier chains and larger pieces. Pouches are a haven for chain knots. 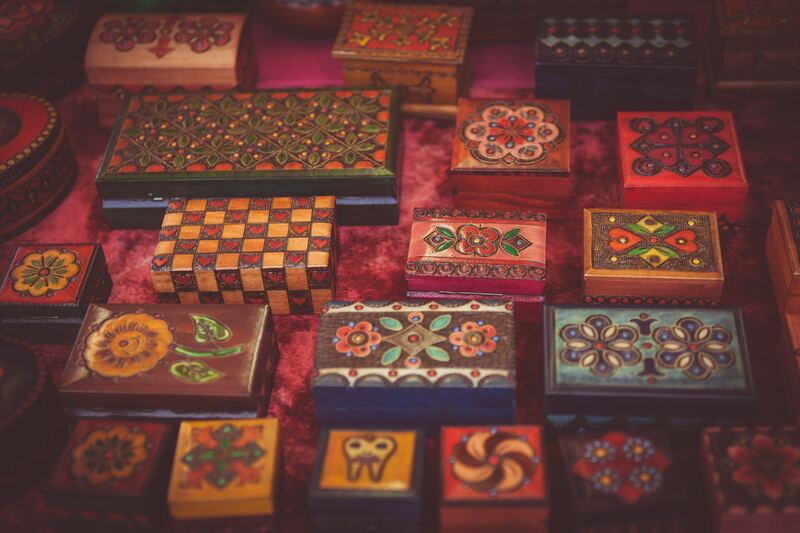 If storing each piece in a necklace box is simply out of the question, hang them. Give each smaller necklace its own hook to be sure they do not interfere with each other. If they absolutely must share space, hang smaller necklaces with larger pieces, less likely to get knotted up. Pearls, plastic beads, and heavy medallion chains are great for storing with your tiniest necklaces. The weight or shape of the pieces will likely leave your fine chains unkinked.